BACKGROUND AND PURPOSE: Manifestation of nervous system involvement by neurobrucellosis, a treatable infection, is not well documented. We investigated patterns of nervous system involvement and determined if neuroimaging abnormalities correlated with clinical manifestations of neurobrucellosis. METHODS: We reviewed 23 MR imaging studies (17 of brain, six of spine) and seven CT scans of brain in 23 patients (14 male and nine female patients; age range 17–71 years) with positive Brucella titers in their serum and CSF. RESULTS: Twelve patients had central nervous system (CNS) involvement, four had peripheral nervous system (PNS) involvement, two had combined PNS and CNS involvement, and five had isolated hearing loss. Imaging findings were variable: five of seven brain CT studies were normal, and 10 of 23 MR studies were normal (eight brain, one thoracic, one lumbar). One brain CT study showed subthalamic hemorrhage, mild perivascular enhancement, left caudate lacunae, and diffuse white matter changes. One other brain CT study showed enhancement of the tentorium in addition to white matter changes. Abnormal MR findings were basal meningeal enhancement (n = 3), lumbar nerve root enhancement (n = 3), granuloma of the suprasellar region (n = 1), diffuse white matter changes (n = 7), and spinal cord atrophy (n = 1). All patients improved after treatment with three antimicrobial drugs for 3–12 months. Seven patients had follow-up imaging; the enhancement disappeared but the white matter and ischemic changes persisted despite almost complete clinical recovery. CONCLUSION: Clinical-radiologic correlation in neurobrucellosis varies from a normal imaging study despite positive clinical findings, to a variety of imaging abnormalities that reflect either an inflammatory process, an immune-mediated process, or a vascular insult. Brucellosis is a zoonosis disease that affects animals as the primary host (eg, camels, sheep, goats) and humans as the secondary host (1, 2). The organisms are Gram-negative short rods that are usually transmitted in the consumption of uncooked meat or unpasteurized dairy products (1–3). The disease is endemic in Saudi Arabia and countries bordering the Mediterranean Sea and also occurs in many other countries (1–4). Neurobrucellosis occurs in 5–10% of cases of brucellosis and affects the central (CNS) or peripheral nervous system (PNS) (3). This may lead to a variety of clinical manifestations and imaging abnormalities that mimic other neurologic diseases (1–11). The aim of our study was to review the correlation between imaging abnormalities and the clinical manifestations of neurobrucellosis. Between 1989 and 2000, neurobrucellosis was diagnosed in 23 patients at our institution. The diagnosis was based on clinical findings of nervous system involvement and positive Brucella serology in the serum and CSF by using the standard agglutinating test before and after precipitation by 2-mercapto-ethanol. The study group comprised 14 male patients and nine female patients aged 17–71 years. We reviewed 23 MR imaging studies consisting of 17 brain and six spine studies obtained in 21 of the patients. The MR imaging studies included nonenhanced and enhanced T1-weighted images, T2-weighted images, and fluid-attenuated inversion recovery (FLAIR) images. In five patients, the MR images were obtained with a 1.5-T system. Conventional spin-echo sequences (2500–3000/102 TR/TE) were used for T2-weighted imaging. T1-weighted images (460–650/10–20) were obtained before and after injection of a gadolinium-based contrast agent (0.1 mmol/kg). FLAIR imaging (9999/119) was performed in only five patients as it was not available before that for the rest of the patients. Seven patients had CT scans of brain obtained before and after administration of contrast material. Cerebral angiography was performed in one patient. Seven patients underwent follow-up MR imaging after 6–12 months of treatment with three antimicrobials (rifampicin, doxycycline, co-trimoxazole). Treatment was terminated on normalization of CSF. The clinical and radiologic findings are summarized in the Table. We divided the clinical manifestation into four categories: 12 patients had CNS involvement, four had PNS involvement, two had combined CNS and PNS involvement, and five had isolated hearing loss as the only manifestation of neurobrucellosis. The imaging findings were divided into four types—normal, inflammation (abnormal enhancement), white matter changes, and vascular changes—in an attempt to correlate radiologic findings with clinical manifestation and reach a better understanding of the effects of brucellar infection on the CNS. Five patients (patients 4, 6, 10, 12, and 15) had normal CT studies (Table). This group of patients did not show any clinical-radiologic correlation with CT, but MR imaging was more sensitive, showing periventricular white matter changes in patient 4 and meningeal enhancement in patient 6. 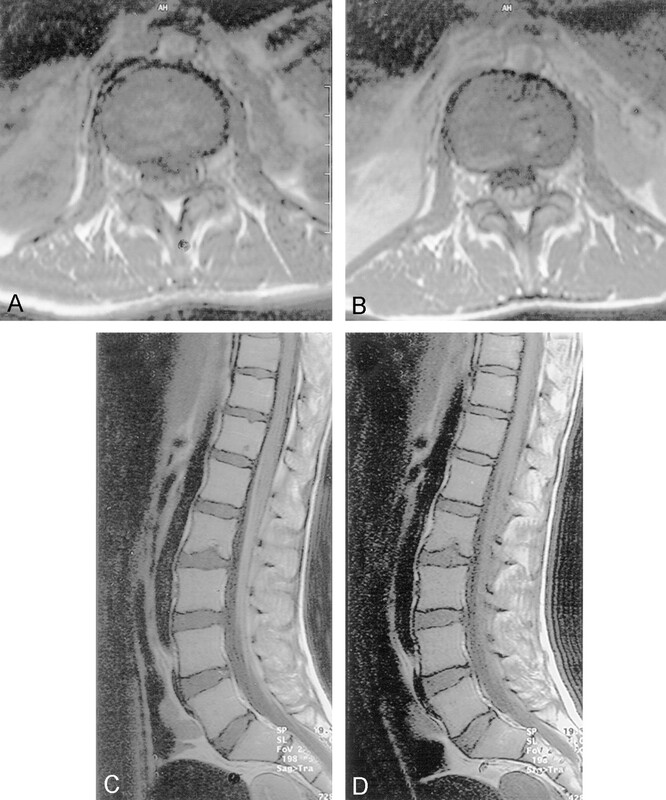 Eight patients (patients 1, 5, 8, 15, 16, 17, 18, and 19) had normal MR images of the brain, one patient (patient 14) had normal MR images of the thoracic spine, and one patient (patient 23) had normal MR images of the lumbar spine (Table). This group of normal MR imaging studies did not show any clinical-radiologic correlation. The second type of imaging finding was abnormal enhancement. Patient 13 had perivascular enhancement on brain CT scan (Fig 1A). Patient 20 had tentorial enhancement on brain CT scan, with significant inflammatory reaction in CSF. Patient 6 had basal and dural meningeal enhancement on brain MR images (Fig 2). Patient 3 had enhancing granulomatous formation in the suprasellar region on MR images (Fig 3A–C). Patients 9, 11, and 22 had lumbar nerve root enhancement on lumbar MR images (Fig 4). 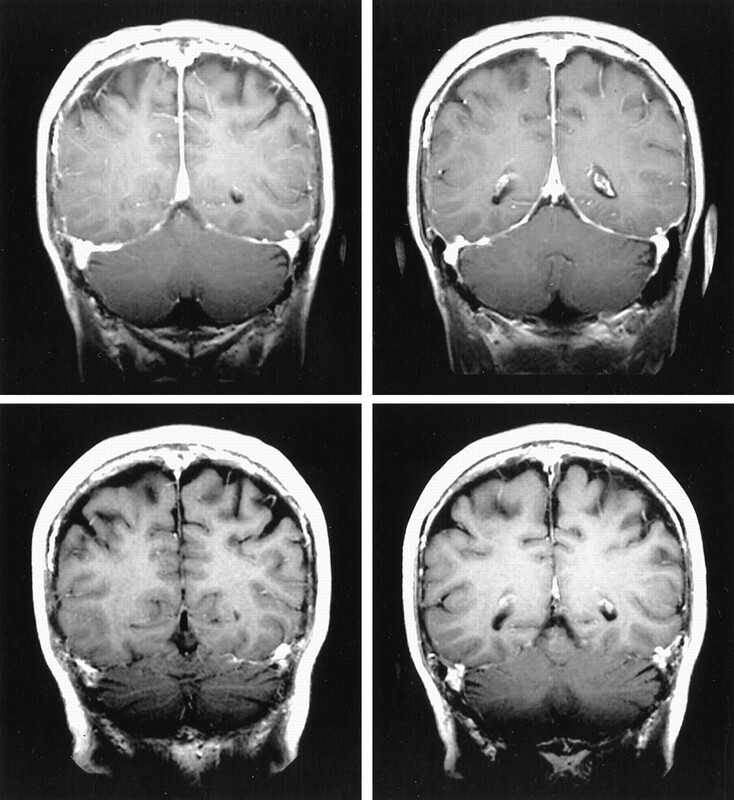 A, Nonenhanced (top) and enhanced (bottom) brain CT scans show left small subthalamic hematoma with perivascular enhancement (left), left caudate lacunar infarct, and diffuse periventricular white matter hypoattenuation (right). B, CT scans obtained 4 months after treatment show that hemorrhage and perivascular enhancement have disappeared, but lacunar infarcts and white matter abnormality persist. A–C, Gadolinium-enhanced T1-weighted brain MR images show granuloma in the hypothalamus and pituitary granuloma. D–F, Gadolinium-enhanced T1-weighted brain MR images obtained 4 months after treatment show resolution of the granuloma. The third type of imaging finding was white matter changes. Seven patients (patients 2, 4, 7, 13, 14, 20, and 21) had different patterns of white matter changes on brain MR images (periventricular, diffuse peripheral, or focal). Patient 7, who presented with spasticity and hearing loss, had right frontal subcortical hyperintensity on T2-weighted brain MR images; spinal MR imaging was not performed. Patients 2, 4, and 14 had periventricular white matter hyperintense lesions on T2-weighted and FLAIR images. Patient 14 also had involvement of the subcortical white matter including arcuate fibers (Fig 5). Patient 13, in addition to periventricular white matter abnormalities on MR images (Fig 1C), had focal hyperintense lesions in the pons and left cerebral peduncle, with no clinical correlation. Patient 20, with right and left hemiparesis, had periventricular white matter changes and right cerebellar and right pontine focal hyperintense lesions on T2-weighted images, with no clinical manifestation referable to them. Patient 21, with acute meningitis and no focal deficit, had diffuse white matter changes on T2-weighted MR images, with no clinical-radiologic correlation. Patient 14. FLAIR brain MR images show diffuse peripheral subcortical white matter increased signal intensity with predilection to arcuate fibers. The fourth type of imaging finding was vascular. Patient 13 had subthalamic hemorrhage on CT scans and an incidental finding of left caudate lacunae (Fig 1A). Patient 21 with acute meningitis had white matter changes on T2-weighted MR images in addition to left caudate lacunae. Some patients had general symptoms such as fever or headache (Table), but all had normal chest radiographs and were immunocompetent with normal complete blood cell counts. None of them had a positive human immunodeficiency virus (HIV) test or history of risk factors for HIV. All patients improved after combination treatment with three antimicrobials (rifampicin, doxycycline, co-trimoxazole) for 3–12 months; however, neither the symptoms of myelopathy nor the hearing loss improved. Treatment was terminated when white blood cells disappeared from the CSF despite persistence of clinical signs or imaging abnormalities. The presumed granuloma formation, as well as the meningeal lumbar nerve root and perivascular space enhancement, resolved after treatment, whereas the white matter changes and lacunae persisted. Seven patients had follow-up imaging studies (patients 3, 4, 6, 9, 11, 13, and 14). Patient 13 underwent brain CT 4 months after starting treatment. The subthalmic hemorrhage had resolved as did the perivascular enhancement, but the white matter changes persisted (Fig 1B). Brain MR images obtained after 2 years showed no changes in the white matter abnormality. 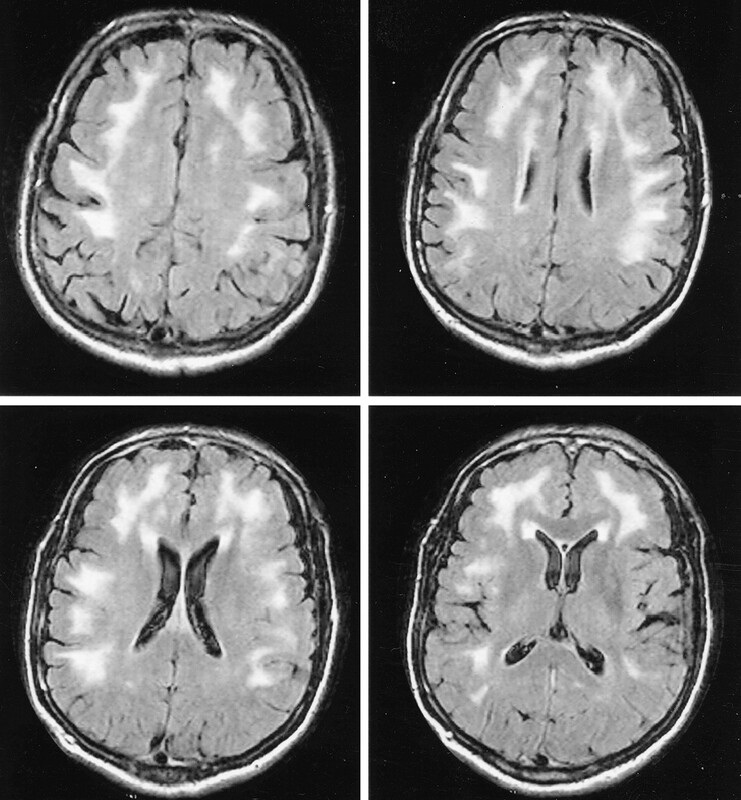 Patients 4, 13, and 14 underwent brain MR imaging 9–12 months after starting treatment; these images showed no improvement in the white matter abnormalities. 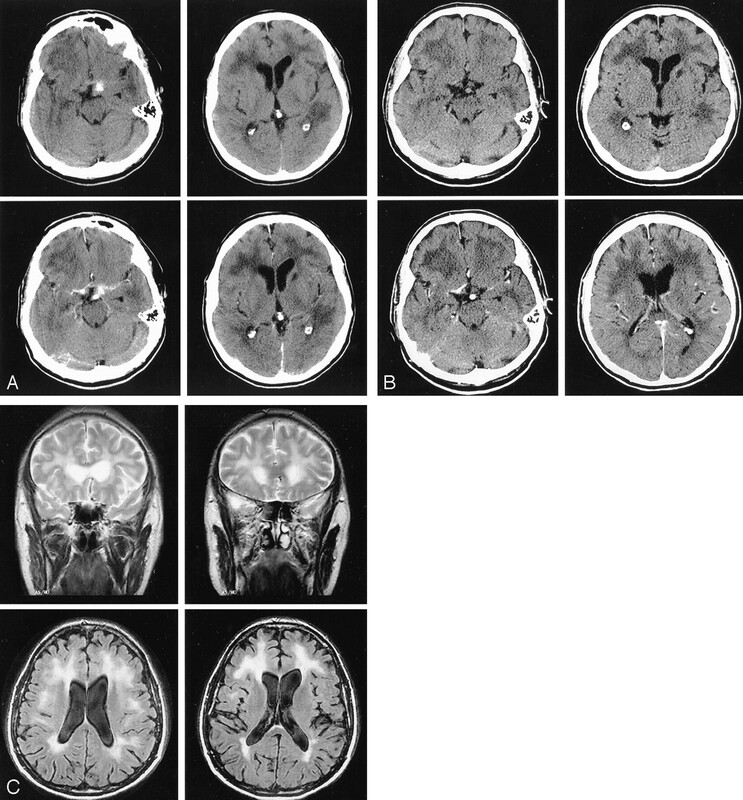 Patient 3 underwent brain MR imaging 4 months after treatment; these images showed marked improvement of the suprasellar granulomatous formation (Fig 3D–F). Patients 11 and 9 underwent MR imaging of the lumbar spine 8–12 months after treatment, which showed disappearance of nerve root enhancement. Patient 6 underwent brain MR imaging after 8 months of treatment, and these images showed disappearance of meningeal enhancement (Fig 2). Brucellosis is a common disease in the Arabian Peninsula and Mediterranean countries. Nervous system involvement, known as neurobrucellosis, should always be suspected in these endemic areas and can be confirmed by raised Brucella titers in the CSF. The outcome is favorable if treatment is started early and continued for an adequate period (1–3). We categorized our patients according to the clinical manifestation, that is, CNS or PNS involvement or, in a few cases, combined CNS and PNS involvement. The frequent occurrence of sensorineural hearing loss in our patients (19 of 23) indicates that brucellosis preferentially affects the auditory system. The onset of deafness was rapid in most instances and was usually associated with brucellar meningitis (1, 10, 12). Three types of imaging abnormalities are seen in neurobrucellosis: inflammation, white matter changes, and vascular insult. Inflammation may cause granulomatous formation (Fig 3) or enhancement of the meninges (Fig 2), perivascular space (Fig 1A), or lumbar nerve roots (Fig 4). The clinical manifestation in this group included headache, papilledema, seizures, confusion, polyradiculopathy, and lymphocytic meningitis. The inflammatory process disappeared on follow-up MR or CT images after adequate treatment, and these patients achieved full clinical recovery (Figs 1B, 2, 4). Granulomatous formation in the sellar region is rare, and our search revealed only three cases described in the literature (13–15). In our study, we encountered one case (patient 3), and there was complete clinical recovery with documented radiologic improvement after 4 months of treatment (Fig 3D–F). Other possibilities of infection or inflammatory disease such as tuberculosis, fungal infection, or sarcoidosis can be ruled out by the negative culture of CSF or granuloma, and the high index of suspicion of brucellosis with (positive) Brucella titers and marked improvement with adequate treatment. In our patients, we noted three patterns of white matter changes that manifested as hyperintense lesions on T2-weighted images. The first pattern is a diffuse appearance affecting the arcuate fibers region, the second pattern is periventricular, and the third one is a focal demyelinating appearance (Figs 1C, 5). The nature and cause of these white matter changes are not known, but they may be due to an autoimmune reaction (1–3, 17). 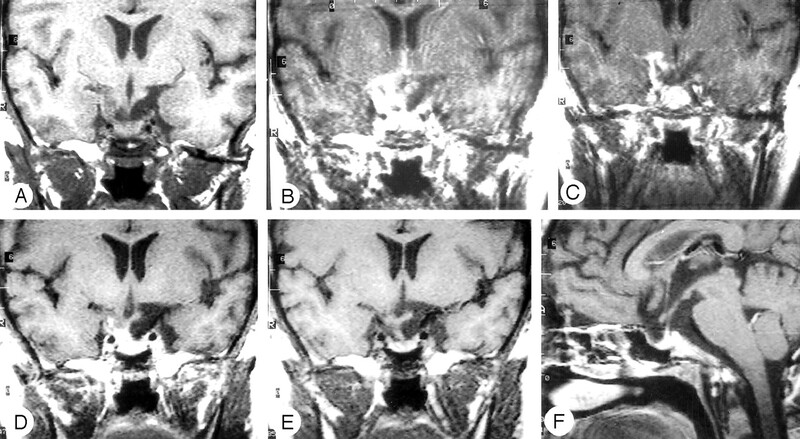 The white matter involvement may mimic other inflammatory or infectious disease, such as multiple sclerosis, acute disseminated encephalomyelitis, or Lyme disease (18–21), but the involvement of corpus callosum in multiple sclerosis and the intraparenchymal subcortical enhancing lesions in multiple sclerosis, acute disseminated encephalomyelitis, and Lyme disease have not yet been described in neurobrucellosis (1, 3). In addition, none of our seven patients with white matter abnormalities had intraparencyhmal enhancing lesions or involvement of the corpus callosum. The diagnosis of neurobrucellosis needs a high index of suspicion in the endemic areas, however, and history of exposure should be sought as the disease may present with protean symptoms and radiologic manifestations. In three of seven of our patients with follow-up MR images, no improvement was noted in the white matter lesions and appearance despite marked clinical improvement and normalization of CSF after adequate treatment. Periventricular edema seen on brain CT scans in the early phase of brucellar meningitis has been reported previously. Complete clinical and radiologic improvement was noted after treatment, but unfortunately MR imaging was not performed so there could be no further evaluation of the white matter changes (8–10, 17). In 1963, Fincham et al (22) reported that the white matter changes in neurobrucellosis were sequelae of the demyelination, as confirmed by pathologic study. Marconi (23) supported this with autopsy evidence of demyelination similar to multiple sclerosis lesions in one patient with neurobrucellosis. In addition, white matter abnormalities similar to the lesions seen in our patients have been described in other patients from the Arabian Peninsula (1–3, 17). This suggests that white matter involvement is related to an immune-mediated reaction in the CNS to the Brucella infection. The vascular insult is likely due to one of two mechanisms. In the first, an inflammatory process of the small vessels or venous system causes lacunar infarcts, small hemorrhages, or venous thromboses (3, 11, 24–27). In this regard, Guerreiro et al (27) described the histopathologic findings in one case of cerebral hemorrhage and attributed this to a nonspecific chronic leptomeningitis. It is interesting that this patient also had local hemorrhages in the caudate nucleus bilaterally (27). The second possible mechanism is a hemorrhagic stroke caused by rupture of a mycotic aneurysm, a likely sequela of embolic stroke from brucellar endocarditis, as reported in a few cases (11, 28). In our study, two patients showed vascular insult. One patient (patient 13) had small left subthalamic hemorrhages associated with perivascular enhancement on contrast-enhanced CT scans and left caudate lacunar infarct (Fig 1). His cerebral angiogram was normal and did not show any vascular malformation. The second patient presented with a picture of meningitis, and his MR images showed lacunar infarct with diffuse white matter changes. As neither patient had vascular risk factors, we believe that they had vasculitic inflammation causing ischemic stroke in one and hemorrhagic stroke in the other. One patient (patient 17) had an interesting finding on thoracic spine MR images that consisted of spinal cord atrophy with a clinical picture of myelopathy and normal brain MR images. We believe that the myelopathy is related to spinal tract demyelination rather than direct Brucella infection because of the absence of pleocytosis in the CSF. Few old reports in the literature describe the neuropathology of brucellosis. A comprehensive coverage of the neuropathology of brucellosis can be found with description on tropical neurology written by De Villafane Lastra (1963). He demonstrated brain swelling, meningeal infiltration, demyelination in roots and spinal cord, and round cell infiltration around vessels within the CNS (29). Neurobrucellosis is a treatable disease with a favorable outcome except when there is a myelopathy or deafness. Imaging abnormalities in neurobrucellosis are variable and may mimic other infectious or inflammatory conditions. The imaging appearance reflects inflammatory or demyelinating processes or a vascular insult and does not always correlate with the clinical picture. The reasons for such variable manifestations remain obscure. Accepted after revision August 21, 2003. Vasculopathic changes in the cerebral arterial system with neurobrucellosis.